The Marvis Jasmine Mint Toothpaste Triple Pack is a great bargain buy. The combination of mint and jasmine flavouring is perfect for giving your mouth a refreshing taste. Unlike many toothpastes, this Marvis variety can leave you with a tingling sensation that ensures a clean feeling for hours. Designed to combat bad breath, tartar and plaque, the cleaning properties of this jasmine mint toothpaste are amazing, and your teeth are also protected from decay, thanks to the addition of fluoride to the toothpaste. The vintage style of the packaging is perfect for any bathroom - a real change from modern designs. Very Good . I have every morning since I use it . I will buy it again soon. 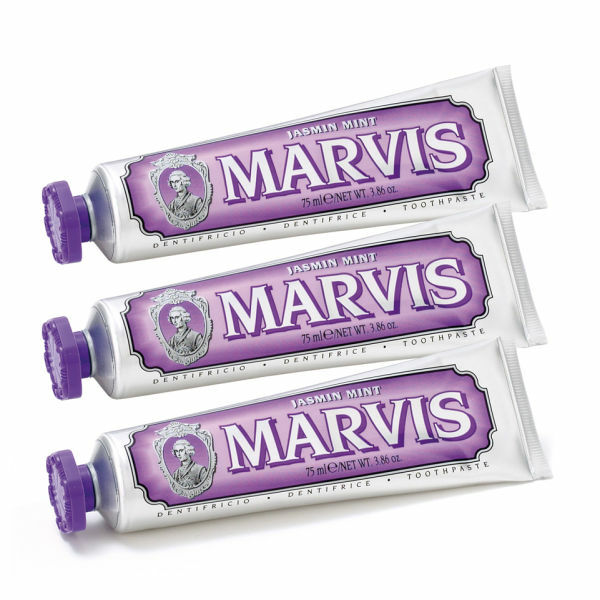 The Marvis Jismane Mint Toothpaste is a great value buy. Very easy to keep cleaner teeth and feeling so fresh after use . I love this product so much,and will buy it again. The toothpaste tastes just as good as it looks and I am sure you will love it after you try it . It's smells so nice! I love it so much!This is my first to try , it's an amazing exclent toothpaste! enjoy the life enjoy the mavis! The toothpaste tastes just as good as it looks. Only fault is the package of three since i would like to try out the others from the same brand but it takes forever to use all three. nice packing and design, good smell, but there is little foam, much less than any other toothpastes I have ever used, it's strange. its so good ~~~i will buy it again!